Happy ’14, ladies and germs! 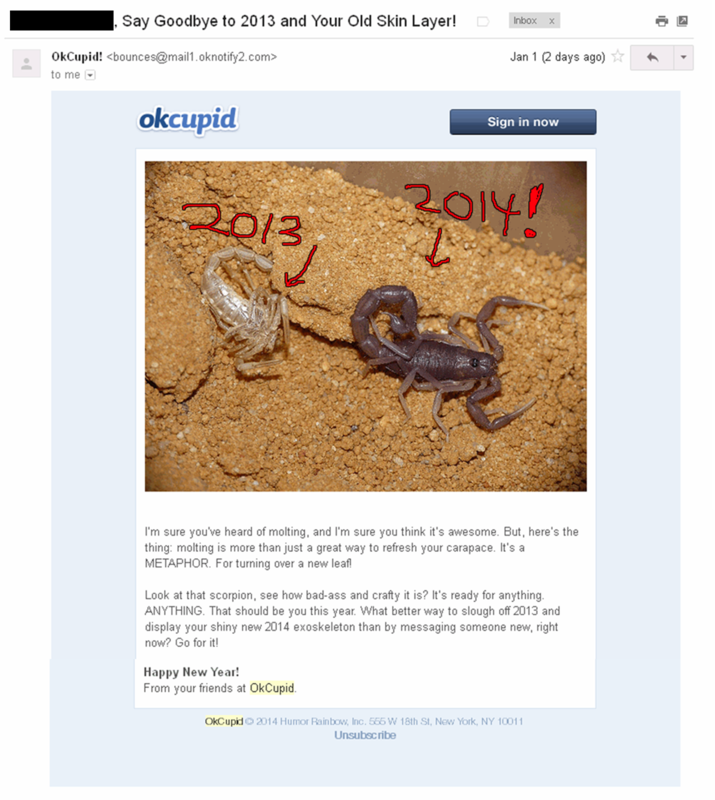 me: Did you get that terrifying email from Okcupid with the gross picture of the scorpion? L: (smugly) Actually, I changed my settings so they can’t email me about anything. So I wouldn’t know. me: Yeah, but this was not your typical ‘so and so messaged you’ kind of thing. It looked like a mass message to all their users. You didn’t get it? It’s absurd. L: No, like I said, my privacy preferences prevent them from ever contacting me. You should try it. listening with feigned interest to what so and so’s boyfriend/husband gave so and so and isn’t it SOOOOO thoughtful (meanwhile the most thoughtful thing a dude has ever given me is flowers from Wegmans. I’m serious). HAVEN’T SINGLE PEOPLE SUFFERED ENOUGH? I’m just over here trying not to hang myself from my shower curtain rod because it’s Monday, January 6th, it’s raining cats and dogs, I have a hangover that was a month in the making, and essentially nothing to live for over the next three months except primetime TV and awards shows. So THANK YOU for brightening my day by comparing me to a grotesque, deadly creature that’s too disgusting and scary to even look at. And may I add, nothing puts me in the mood to “turn over a new leaf” and send some flirty messages to cute boys like staring at the dead skin of a poisonous arachnid. Talk about insult to effing injury. Why do I even use this stupid service, again? Its gonna be a rough year, huh? S your writing makes me eternally happy.